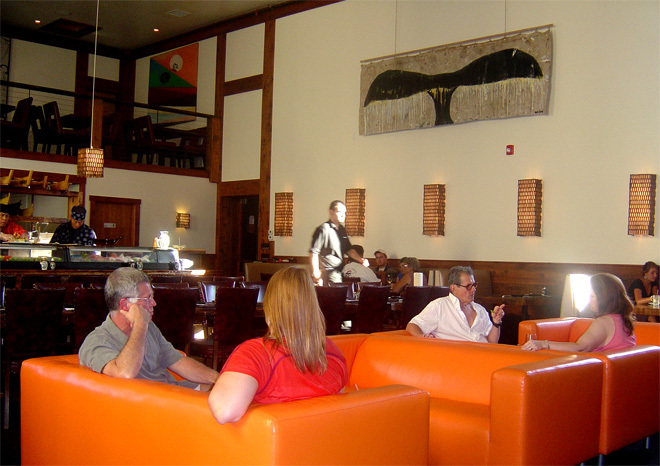 As Provincetown has become more and more of a destination for tourists from all over the country and the world, the restaurant scene has responded with a number of new upscale establishments that cater to the more sophisticated palettes of its visitors. Saki, which opened in 2009, is one of the best of the new eateries offering a menu that even four or five years ago would be unheard of in a town where for years lobster and chowder were typical fare for most of the town restaurants. Housed in a building that was originally built in 1843 as a Methodist Church next to the Town Hall, the restaurant was lovingly restored by owner Steven Schnitzer and converted into one of the most beautiful and spectacular rooms in town. Schnitzer, who discovered Provincetown while in college and has been a local business owner for over 25 years, recognized that the town really didn’t have an upscale restaurant that focused on authentic Asian style cuisine. In typical fashion, he began a restoration of a space that had been everything from a movie theater to a disco and created a truly elegant dining environment. Schnitzer felt that with twenty foot ceilings and 10 foot high windows, the room was too spectacular for something ordinary. He used the original church floorboards for a bar and tables and the church steeple, destroyed by a hurricane in the 1940s, as the support for the back bar creating a restaurant whose design and menu was unlike anything in town. As a seasoned business owner and restaurateur, Schnitzer knew he had to create a menu that matched the quality of the room. Based upon the crowds that have flocked to the restaurant, he has been hugely successful. Using only the freshest ingredients, well tested recipes and locally fresh fish, as well as exotic fish flown in daily from places as far away as Hawaii, Saki offers the discerning diner a large and varied menu of almost exclusively fish prepared and served in way that rivals any of the most exclusive New York or Boston restaurants. Checking out the Saki menu on their website will likely make you conflicted about which of the delicious sounding items you will want to try. As a suggestion for a starter, you might want to try the Tempura Oysters – freshly shucked oysters in a light tempura batter served with both a spicy mayo and Wasabi mayo. The light and tasty shrimp summer roll is a winner for those wanting to save their appetites for the rest of the meal. 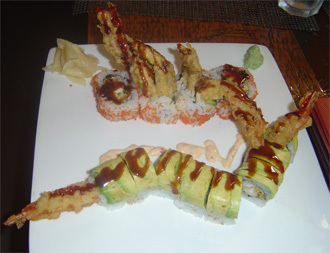 From the broad selection of main course plates, the spider roll-soft shell crab, mayo and cucumber and the Green Dragon roll – tempura battered shrimp, avocado and spicy mayo are sure to make it on to your list for your return visit. If you are with a group of friends, Saki’s several sizes of specialty boats offer a way to sample a variety of Saki’s tasty offerings. For those who cannot end a meal without a dessert, Saki’s offers a limited dessert menu that includes homemade Key Lime pie, a specialty of the house imported from Schnitzer’s other restaurant in Miami. If you’re on Cape Cod and looking for a really wonderful and untypical dining experience, Saki in Provincetown is well worth the visit.